Thank you for rescuing me! Now what? When deaf dog Riddick’s mom shared her wonderful Facebook post “Thank you for rescuing me? 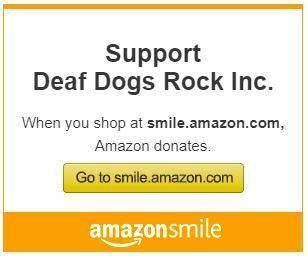 Now what?” it immediately caught my eye because we always want to help new deaf dog owners set their new adopted deaf pups up for success. Every single day my email is filled up with emails from people who have recently adopted a deaf dog and they need to rehome the dog A.S.A.P. Sometimes they give the dog only one day to adjust. I tell each and every one of them it takes up to 6 weeks for a deaf dog to adjust and figure out a structured routine (we pray for structure and rules because our dogs thrive on rules when they know what to expect). When I reply asking them what specifically took place it is always a dog fight over a toy, food or improper dog greetings. 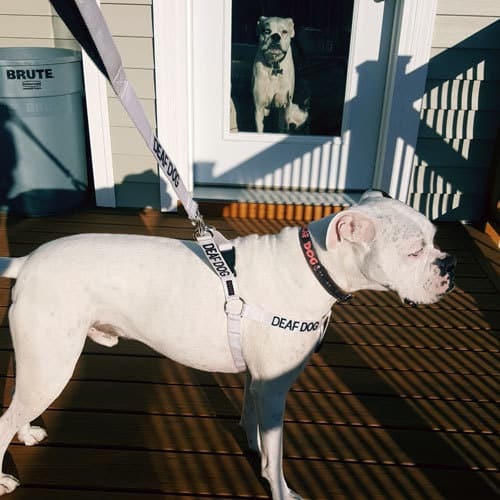 Thank you Beth for taking the time to write these wonderful suggestions and tips on how to integrate a new deaf dog into an established family of dogs and people. I believe this will get each person who reads the post to really think about everything from the deaf dog’s perspective and plan accordingly. Beth Wilson is the Area Coordinator (Central NC) for Carolina Boxer Rescue and she also has a wonderful Facebook page called Adventures in Boxerland. I am a rescue dog. For whatever reason, I found myself in a scary place. My life was saved when I was taken from the shelter. My foster family and rescue organization treated my body for its ills and worked hard to make me feel safe. They loved me until my forever family adopted me. You, my new family, have promised to share your home and love with me for the rest of my life. But, guess what? I don’t know any of that. I just know that I am bring moved to yet another place with some more really nice folks and their pets. Please don’t let this discourage you or take offense. We can figure this all out, but it could take some time and there may be some stumbles along the way. It may help if I could explain what I need from you. In our beginning as a family, please let my world be small. Keep me at home. The stress of all these recent changes will follow me for at least a couple of weeks. I just need to be able to relax and get comfortable with you and my surroundings. I must get used to all those things you may take for granted like feeding and potty schedules, family dynamics and routines, and I must do this all at once. Too much freedom and “newness” is overwhelming. It might make me frightened or defensive All I desire is quiet and you. I really like your kids, but I don’t know them well yet. Roughhousing or running screaming in the house, even in fun, may worry me and make me uneasy. Good games for children to play with me at first might be to have me sit for treats or walks on a leash in the house. This will teach me and the kids how to interact with each other. After all, wild behavior only gets all of us more wound up and makes mistakes more likely. Actually, the same goes for your dog. We dogs have to work out our relationships with a language all our own and forcing us together too quickly may set us up for failure. If anything happens, it then makes it even harder to for us get along for a while. We are big on first impressions. Allow us to get to know each other while on walks or behind gates. Face to face meetings are confrontational to a dog. Remove chews or toys before bringing me home. And feed us in separate rooms. We will have less to argue over that way. The more time you can give us to get to know each other the better. I mean possibly weeks, not hours. Keep us separated. Crate, gate, and rotate us for as long as you feel it is needed. You cannot move too slowly here. Dog friendships are even more important and delicate that that of owner and dog. They are built on trust and we need time to develop that. Make me sit to do everything. I should be calm before going out, coming in, before treats and eating, getting leashed, etc. I need to recognize that you are in charge here and that I need to listen. While bouncing off the walls before walks is funny, you are teaching me to act that way every time. Show me that only calm behavior gets rewarded. An obedience class we can do together is always recommended. It helps us speak to each other successfully. There are some rules of three that you may need to be aware of. For the first three days I may exhibit nervous behaviors like barking or pacing. I may whine, have accidents, refuse to eat or be argumentative. I’m terrified and stressed. I need that small world and quiet. After about three weeks, I will begin to get the hang of things. And then I will start to push some buttons or act out in ways you have not seen before. It’s a test to see where I fit into this household and how much I can get away with. Be calm and firm and stick to your guns. Maybe leave a leash on me so you may remove me from mischief or trouble. Praise me for what I do right. Redirect me when I am doing something I shouldn’t. This is the toughest time of adjustment. After about three months I will begin to really feel at home. My issues will have reared their ugly head and you will have had a chance to get them under control. Don’t give up on me. Seek help from a reputable trainer if you feel you need it. A good one is worth the investment. Speaking of issues, there will be something you will have to deal with. My foster home will share their experiences, but I may act differently in your home. And remember, I was only in foster care for a few weeks and I may not have been feeling my best. I am adult dog who was raised by someone else. They may or may not have done a good job. However, I am still trainable. Instead of waiting to see what I know, assume I know nothing. Teach me and train me like I was a puppy. This way I can quickly learn what you expect from me and I will not make as many poor decisions on my own. I am happy to take your direction. I want to be the dog you want me to be. I can be a wonderful companion for your family if given the guidance I need. Give me consistency, and patience, and time and I will give you all the love I have to give in return. I may not know what being rescued means, but I will thank you for my life every day with tail wags and slobbery kisses. Let’s do this!